Your Raising Your Kids Where?! Today I am in the city of Phnom Penh sitting at Starbucks far from my wonderful kids who are being homeschooled by their dad. It’s a nice break but city life isn’t for me anymore. I’ve come to love the country way of life. The way nature invades every moment of our day. Sleeping, eating, and even bathing in open air. Food is simple and spiced naturally. The people work part time and hang out the rest of the time. Some don’t even earn or use money but raise and plant what they need. These kind of people have time and though they experience stress it’s less than city dwellers. So back to my kids! They have a lot of teachers out here. 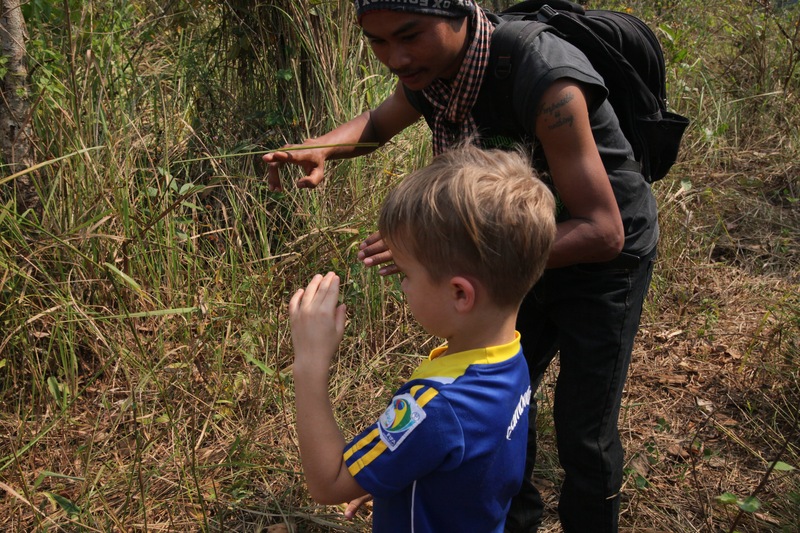 Like this Khmer/Bunong man teaching my 6 year old the ways of the jungle. Homeschool is a mix of dance, play, study, and helping each other. When visitors come, it’s non existent. But, they meet the requirements and not only that they each excel in their own giftings. Some days we school at home, near waterfalls, in the car, or a hotel room. Some days we serve the poor by helping build water catchment tanks at schools or assisting in teaching English. I guess I’m saying that we are happy. Happiness is a gift from God that comes and goes but for now, I’m choosing to stay in the present and enjoy the happiness He is blessing us with now. I sat and watched the tree pictured below. 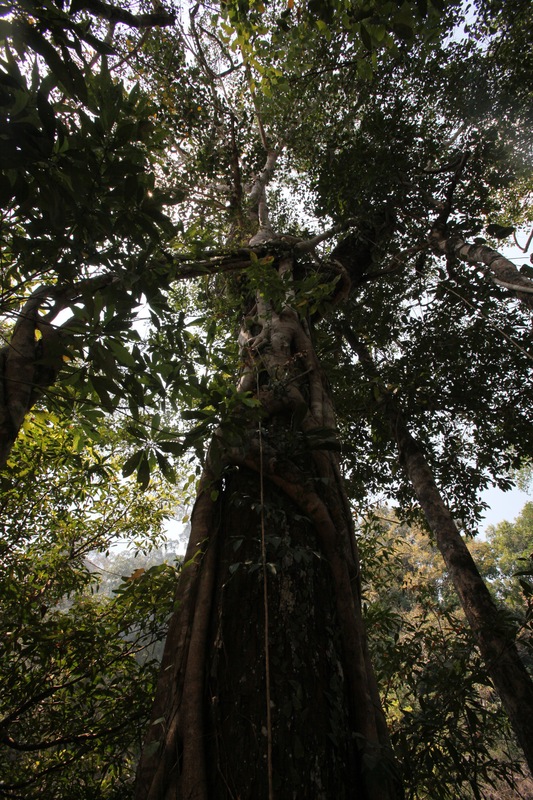 Amazed at how multiple trees wrapped themselves around each other tight which make the trees stronger as they reach up for the sunlight in a dense jungle. Planted near the water, they are set for life. My family is that tree. Beautifully wrapped around each other so each branch can fulfill its life purpose. Planted in the roots of our faith. We feel like a symphony as each member plays in tune with the other. Let’s see the good in life together! ← How To Walk In The Room and Be THAT Person! Thank you so much. It’s funny how things look now because when we moved there family and friends thought we were crazy but the risk has shown to be a huge blessing. Thank you for coming by and commenting today! So beautiful! 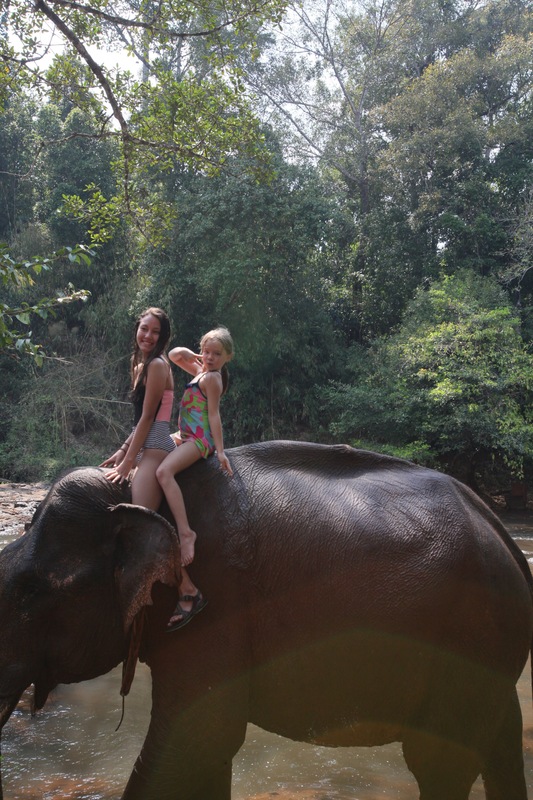 I love the pictures, and really love the one of the girls on the elephant. Such amazing life experiences! Thank you Jennymarie! It is an unusual way to live and that use to make me nervous. But, I’ve realized the risks were worth it! Thank you for taking time to comment. 😊please come back again with your sweet words. Love the encouragement! What a beautiful post and way of life. Your children are very blessed to be raised in such a happy and natural environment. Thank you for sharing some lovely moments. Thank you Miriam. It’s our love for nature that pushes us into these kinds of places. Just like you! Thank you for reading and commenting today. I always love hearing from you. Thank you! Yes, us homeschoolers are still out here around the world! It’s the perfect way to travel. Thank you for commenting. Keep holding on to those positive thoughts! They are fortunate indeed 🙂 Nothing like the kind of education travel itself provides. So glad you all are able to live and love and grow together in this Cambodian paradise! That would be amazing Ann. We’re working our way back east on the bucket list. In 2018 (or 2019 if we’re getting slow) this would be a spectacular spot to explore and settle down in for a few weeks/months. You’ve done an excellent job if making it sound so idyllic. Thank you Lorraine! I agree, kids remind us how simple and carefree life was intended to be. Thank you for taking the time to comment! Fix your title, please. You’re killing me here. City life has a lot to offer. Proximity to everything you could want. It would still be a poor substitute for what your children seem to be experiencing. Love it. Your right! At least once a month I have to get to the city and enjoy the city lights too! Thank you for stopping by! I think you guys are doing a wonderful thing! If I could do this I would, but I share custody. Being a middle school teacher, I see the stresses that my students are under and the pressure to excel at things that, in the end, are primarily superficial. It makes me sad. This makes me very happy. Thank you. So good to hear from you. Thank you for teaching. Love those kids! They need your encouragement to reach their potential. Good job! Great post! Homeschooling is not just sitting down with books, but can be a part of all life. Learning can happen anywhere if we let it and use the opportunities that are right there in front of us. Thanks for sharing.